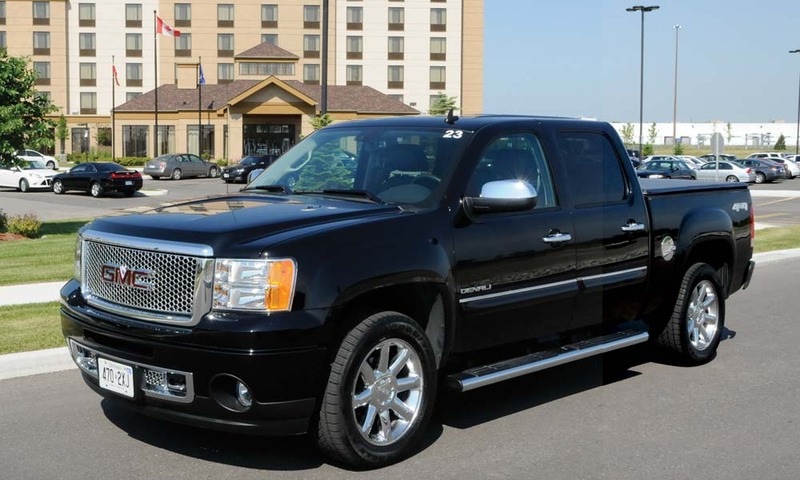 The distinctive 2013 Sierra Denali HD models blend heavy-duty capability with distinctive style and luxury appointments and include many new and revised features. A number of previously optional features are now standard, such as a Denali-specific chrome grille that makes the truck instantly recognizable. Additional chrome trim and body-colour bumpers further distinguish it. 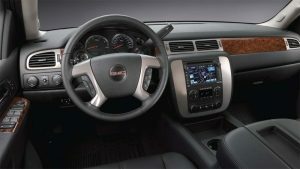 Sierra Denali also offers a unique combination of interior style and luxury, including an exclusive leatherwrapped and heated steering wheel featuring wood-grain accents, and 12-way power-adjustable front seats with standard nuance perforated leather-appointed that can be heated and cooled. A Bluetooth phone package is now standard on all models, and a hard-drive navigation radio with CD/DVD and USB port features is now available. Denali models feature a unique center console, enhanced interior bright work and detailed, highly finished embossed sill plates. The center console has wood grain trim and a lid that conceals the cup holders, creating a more finished and refined appearance. Dual-zone automatic climate control is standard with an auto-dimming rearview mirror on 2500 Denali HD and 3500HD Denali models. 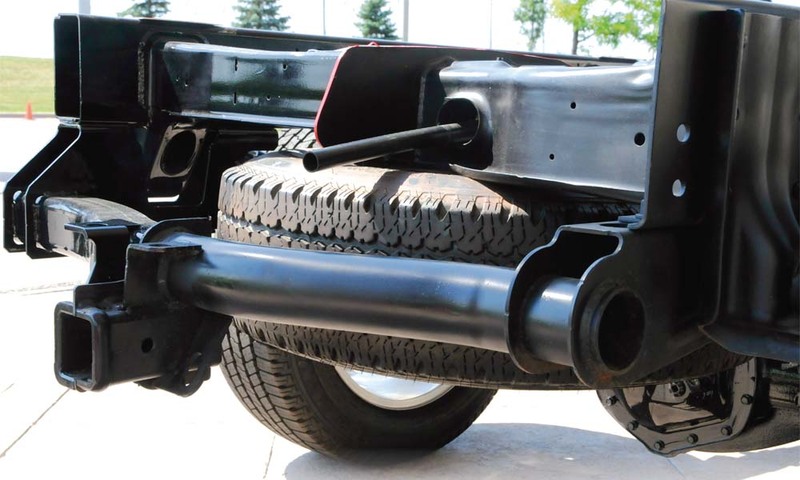 The standard class 5 trailer hitch is designed for great towing ability. Standard features on the new Denali 2500HD and 3500HD include an auto-dimming rearview mirror, power-adjustable pedals, remote vehicle starter, two auxiliary 12-volt power outlets that are mounted on the instrument panel, and front recovery hooks. Denali crew cab models have an optional power-operated rear sliding window, and a power-operated sunroof, but this feature is not available on extended cab models. The 3500 HD Denali with dual rear wheels has seventeen-inch forged polished aluminum wheels and these are available on the SLT models that have dual rear wheels. Eighteen-inch forged polished aluminum wheels are standard on 2500HD Denali models and 20-inch forged polished aluminum wheels are available on 2500HD Denali. New exterior colour choices include Sonoma Red Metallic and Heritage Blue Metallic, which replaces the Midnight Blue. Other choices are Onyx Black, Mocha Steel Metallic, Stealth Grey Metallic, Steel Grey Metallic, Summit White, Fire Red, and Quicksilver Metallic. Sierra Denali HD models are offered exclusively in the crew cab body style, in regular- and long-box configurations and in 2WD and 4WD. The Duramax diesel/Allison 1000 powertrain is available across the board. Sierra HD models are designed to be comfortable and convenient while on the job, with features that include 170-degree-opening rear access doors on extended cab models and numerous storage compartments that provide covered access for everything from work gloves to laptops. A Vortec 6.0L gas V-8 engine with variable valve timing is matched with the Hydra-Matic 6L90 six-speed automatic transmission as the standard powertrain across the Sierra HD model range. This combination delivers excellent performance and efficiency, with an emphasis on low-rpm performance. This year, the Vortec 6.0L V8 SFI engine can be ordered powered by Compressed Natural Gas. For diesel performance, the 6.6L Duramax diesel glow plugs take no more than three seconds to warm up in temperatures as low as -29 C (-20 F) so that in cold weather it provides a starting time on par with gas engines. The engine uses a high pressure piezo-activated fuel system for greater efficiency and improved performance with reduced emissions, developing 397 horsepower at 3000 rpm and delivers 765 pounds-feet of torque at 1,600 rpm for greater ability to pull your trailer up hills. The combination of the 6.6L diesel and Allison 1000 six-speed automatic transmission powertrain is available on all 2500HD and 3500HD models The transmission features driver shift control with tap up/tap down shifting and a patented elevated idle mode cab warm-up feature. Also, the tow/haul mode reduces shift cycling for better control and improved cooling when towing or hauling heavy loads. The 6.6L diesel engine uses Selective Catalytic Reduction aftertreatment system with diesel exhaust fluid (DEF) injection to provide the best overall diesel characteristics and performance. You can drive about 8,000 kilometers (5,000 miles) between DEF refills. Combustion and after-treatment have been optimized to provide about 1,125 km (700 miles) between diesel particulate filter regenerations – a 75-percent improvement over the previous system and significant contributor to improved fuel efficiency, as the regeneration process requires additional fuel. All Sierra HD models feature fully boxed frame assemblies. Redesigned last year, the frames have reinforced cross sections and use more highstrength steel for greater durability, higher towing capacity and improved ride and handling. The front sections are hydroformed. Five different torsion bar rates support five different front gross axle weight ratings with short-long arm/ torsion bar front suspension featuring forged steel upper control arms and precision- machined cast iron lower control arms help stabilize the range of trim heights of various models under load, while enhancing appearance, handling, durability, tire wear and alignment. The trim height can be adjusted on each bar via a single bolt. The upper shock mount attachment design is positively connected to the frame with two fasteners, eliminating squeaks and clunks, while supporting higher load capability and increased durability. Asymmetrical leaf-spring design minimizes axle hop and enhances traction control efficiency, with twostage leaf-spring design on 2500HD models and three-stage design on 3500HD model. All models feature 3-inch-wide (76 mm) leaf springs. Four-wheel disc brakes with hydroboost are standard on all models, with four-wheel, four-channel ABS standard on all single-rear-wheel models and a three-channel system is standard on dual-rear-wheel models. The Heavy Duty Trailering package with integrated brake controller and Eaton automatic locking differential are now standard on all Sierra 3500HD models. With a crew cab/long box and 6.6L engine you can tow a fifth-wheel trailer of up to 10,432 kilograms (23,000 lbs), and you can tow a conventional travel trailer of up to 8,164 kilograms (18,000 lbs) with the box-tube designed frame-mounted hitch . Heated outside and power-adjustable vertical camperstyle mirrors with turn signal indicators are available on 2500HD Denali and standard on 3500HD Denali models. The Denali’s rugged suspension provides a significant fifth wheel towing capability. When you are stopped on a hill of five percent or greater, sensors automatically engage the hill start system to hold the brakes for 1.5 seconds, or until you press the gas pedal to give you time to switch from the brake pedal to the gas pedal without rolling back. The standard exhaust brake system allows you to control the speed of the truck and heavy trailer when navigating long downhill grades without the fear of the brakes overheating and fading. Trailer sway can unnerve any driver when towing a large trailer. 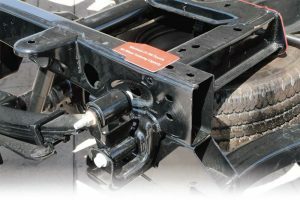 Sensors detect any sway and intervene with braking and/or reduced engine power to bring the trailer under control and keep it on its intended path quickly. Denali is the designation that General Motors gives to the top-of-the-line models that reflect GMC’s loftiest engineering and design achievements and deliver the best of all worlds to the driver. Whether you are towing a boat, travel trailer or fifth wheel, the GMC Sierra Denali will provide the power that you need to get you to the destination of your choice.